Scientists at Johns Hopkins Medicine and the National Tsing Hua University in Taiwan say they have found a fast way to manipulate a cell's cilia, the tiny, fingerlike protrusions that "feel" and sense their microscopic environment. The experiments, performed in mouse cells, may advance scientists' efforts to not only understand how the nanosized antennae work, but also how to repair them. 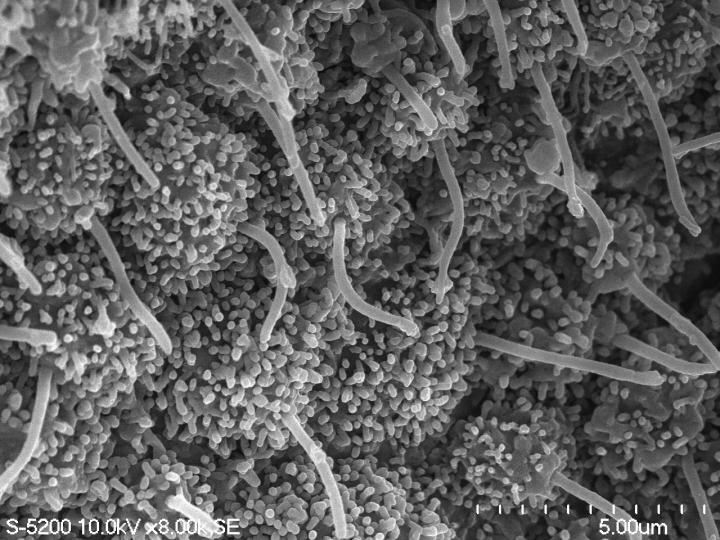 "When I was a postdoc, a colleague in a neighboring laboratory was studying cilia, and I hoped that by combining his knowledge of the biology of cilia with my expertise in cellular engineering, we could figure out how to manipulate cilia within their tiny spaces," says Takanari Inoue, Ph.D., professor of cell biology at the Johns Hopkins University School of Medicine and an author of the new report. To do it, Inoue and his colleagues in Taiwan used a tool called chemically inducible dimerization, which they say is faster than efforts to manipulate the pathway by rewriting the cilia's genetic code. The tool, essentially, is a matchmaker — it helps to mesh two specific chemicals together at specific sites within a living cell. As a result of rapidly removing glutamylation in cilia, the scientists found that molecules flowed up the cilia, toward the tip, more slowly — about .3 micrometers per second — compared with .4 micrometers per second, using a dead enzyme that doesn't affect glutamylation. "We think our technique is faster than existing means of tracking cilia activity and enables scientists to access cilia parts faster and dive into specific chemical modifications for certain amounts of time," says Inoue. "Our STRIP system offers a new strategy for precisely controlling microtubule modifications in living cells. With this approach, it becomes possible to understand how microtubules regulate cellular functions and may also serve as a new way to treat human diseases in the future," says Yu-Chun Lin, Ph.D., an assistant professor at the Institute of Molecular Medicine at the National Tsing Hua University in Taiwan. Co-authors include Cuei-Ling Wang, Shi-Rong Hong, Yao-Shen Huang, Yu-Chen Chang, Ya-Chu Chang, Chun-Yu Lin, Ning Hsu, Hsiao-Chi Cheng, Yueh-Chen Chiang, Wei-En Huang and Yu-Chun Lin from National Tsing Hua University, Taiwan; Ganesh V. Pusapati and Rajat Rohatgi from Stanford University and Nathan C. Shaner from the Scintillon Institute. Funding for the study was provided by the National Institutes of Health (GM105448, GM118082, R01DK102910), the Ministry of Science and Technology, Taiwan, Program for Translational Innovation of Biopharmaceutical Development-Technology Supporting Platform Axis-nMACS Imaging and the National Tsing Hua University.